Recent reforms to the energy sector have meant that Pemex has had to define its priority areas, those areas where it wishes to continue exploration and development. At a later date, it is then possible for the government to ask for bids from other oil companies, and award contracts to explore and develop oil and gas fields in other areas of Mexico. The first stage is known as Round Zero. In March, Pemex published its portfolio of areas for exploration for “Round Zero” (Ronda Cero), with preliminary data for 2P (proven, probable) and 3P (proven, probable, possible) reserves as of the start of this year. 2P reserves totaled 24.174 billion barrels of crude equivalent, while 3P reserves totaled 43.8 billion barrels. The figures, slightly lower than the equivalent figures from January 2013, have not yet been confirmed by independent auditors. 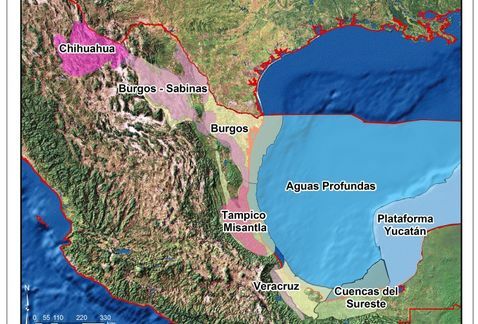 46% of probable reserves are located in Chicontepec (Proyecto Terciario del Golfo) in Veracruz, and 43% in offshore regions including the Akal, Balam, Ayatsil, Maloob, Kunah and Tsimín fields. 56% of possible reserves are located in Chicontepec, and an additional 34% in offshore regions.